Before I fly off on Sunday, it seems apt to finish my delayed report on flies that hails back to Patrick Grootaert’s lunchtime talk at NUS a few weeks ago. Flies (order Diptera or two-winged – unlike most flying insects, flies have converted their hindwings into gyroscopic stabilisers called halteres) suffer from bad press. Admittedly, certain members of their order make it their business to bug mankind around the clock. Houseflies swarm over our filth by day and come twilight, mosquitoes feast on our blood (although there are plenty of deadly diurnal species as well). On the silver screen, Jeff Goldblum does the group no favours by playing an anthropomorphised mindspawn of hairy legs and clammy claws oozing with repugnancy and rancour. In juvenile tomes on spectacled pigs and severed hog heads, gory tribute is paid to the ravenous manifestations of Beelzebub. And ancient biology textbooks for tropical climes carry prominent chapters on the threat of everlasting sleep bestowed by the tsetse fly, while the botfly preampts Ridley Scott’s social insect of science fiction with a parasitical life-cycle that sounds as repulsive as it looks. But with some 150,000 described dipterans and counting, it’s an injustice that the order is perceived by many as an amalgamation of gadflies bred for the sole purpose of bringing multiple plagues onto man. Malaria, dengue, yellow fever, river blindness, typhoid, mylasis, dysentery, West Nile virus and encephalitis do come to mind, although I would like to add to this list of severe afflictions my belated discovery of handphone ringtones that utilise the amplified buzz of a mosquito. But the vast majority of fly species poses no threat to man and a fair number perform ecological roles that are more often attributed to groups such as butterflies and ladybugs. Bee flies and hover flies are unvalued pollinators (hover fly larvae also prey on aphids), while robber flies are aerial stunt flyers that consume many of their fellow dipterans. Parasitical flies that lay their eggs on pest species are also undervalued biological control agents. Members of the family Tachinidae deposit their eggs on caterpillars and other invertebrates, while other groups have maggots that consume snails and slugs from the inside out. The larval host specificity of some genera also make them potential allies for controlling invasives; Hydrellia bilobifera, for instance, feeds only on the cosmopolitan aquatic weed, Hydrilla verticillata. The fields of molecular biology and population genetics would also be much poorer without that frugivorous lab rat known as Drosophila. And if one can admire the beauty of butterflies, why should the more dapper members of Diptera be ignored? Dr. Grootaert (left) is no maverick flyboy but he certainly buzzes with enthusiasm when he speaks about his favourite little animals with unreasonably long names. 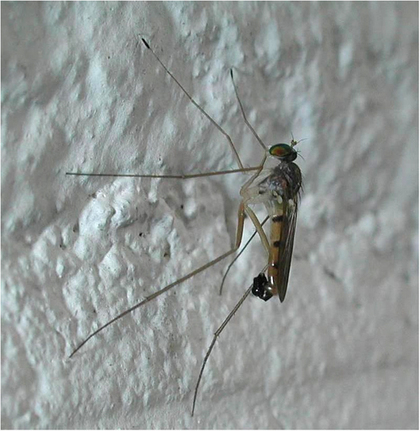 The highlight of his talk, in which he presents an overview of a productive annus mirabilis far from Belgium’s gloomy dunes, was dolichopodid or long-legged (dolicho being Greek for long) flies. Observant ducks may at times see a bright green fly with long, dainty legs resting on vegetation close to the ground. Not uncommon in local gardens and parks, dolichopodid flies in the subfamily Sciapodinae offer a charming introduction to the family. Besides being distinctly non-annoying, these little green flies feed on other insects, in particular midges and mosquitoes, and dance a mean polka to demonstrate their practical utility and justify their pitiful existence to the glorious naked apes that claim dominion over all the earth. 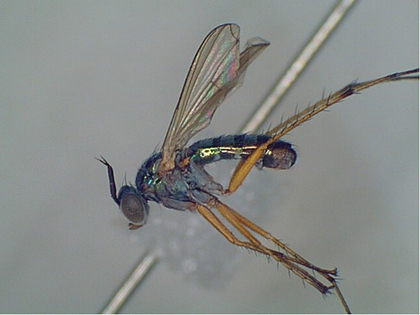 In short, the family Dolichopodidae consists of small, slender, long-legged flies with reduced wing venation that often display a shiny and metallic colour. Many species are associated with water, their larvae being predators of chironomid, ceratopogonid and culicid larvae (midge and mosquito larvae in other words). They lay their eggs in damp soil or mud and their often very specific habitat requirements (e.g. humid stream banks, freshwater swamps and mangrove edges) make these flies excellent indicators of sites that are undisturbed and pristine. The family is highly speciose, with over 200 genera and about 7,000 known species. Male flies often feature highly modified secondary sexual features (antennae, palps, wings and legs – the bristled foretarsus of a male Neurigona squami is shown on the left) which are used in mating displays as well as distinctive genitalia (known as a hypopygium). This means that they must suffer the indignity of having their ducks dissected, macerated in potassium hydroxide and mounted for microscopic examination before taxonomists can identify them with precision. Those with a taste for strange etymology would also find interest in at least two dolichopodid species. Campsicnemius charliechaplini is a fly named after the great silent movie comic owing to the fly’s tendency to die with its midlegs in a bandy-legged position. Why another fly is christened C. uncleremus is less clear. Grootaert’s fascination with Singapore’s dolichopodid flies stems not only from his discovery of some 150 new species (including 4 new genera) over his year-long exploration of the island’s habitats. There are also many findings that shed new light as well as cast wider shadows on the phylogeny and biogeography of dolichopodids and allied fly families in relation to the geological history of Southeast Asia. One can justifiably ask: why Southeast Asia? And why Singapore, of all countries in this region rife with other locales bursting with biodiversity? Because Singapore is number 1 in everything, of course! There are certainly practical reasons (good food, pretty girls, life-science friendly bureaucrats) for Dr. Grootaert’s choice, but it’s worthy noting that this island straddles the epicentre of a biogeographic region that has experienced a bestial confluence of fauna – from the north comes a mingling of Palaearctic and Oriental species while Australasian influences colour the region’s southern fringe. Back in Belgium, Dr. Grootaert actually spend more time dealing with dance flies (family Empididiae). Empidids are thought to be a sister group of dolichopodids and both are placed in the superfamily Empidoidea. Their vernacular label arises from the synchronised movements formed by courting swarms. Males of some genera employ the epigamic strategy of enticing females using captured prey, although the ‘gift’ can turn out to be an inedible object or simply a mash of bodily secretions. Predominantly Palaearctic in distribution, the small number of tropical empidids were known mainly from cooler montane habitats. There are few dance flies in Southeast Asia and thus, dolichopodids offers a more credible raison d’etre for spending a sunny sabbatical in balmy climes. But during his surveys, Dr. Grootaert has come across a surprising cache of empidids that live along the coasts of Southeast Asia from Thailand to New Guinea. A paper he co-authored with Igor V. Shamshev in 2004 describes four new Microphorella species (Empidoidea, Microphoridae, subfamily Parathalassiini) collected from Malesian beaches. Shamshev and Grootaert also reviewed the genus Stilpon (Empidoidea, Hybotidae) in 2004, providing keys to seventeen species, sixteen of which were new. From Singapore and Southern Malaysia, Christophe Daugeron and Grootaert described in 2005 five new species in the Empis Coptophlebia hyalea-group (Empididae, Empidinae), while Grootaert has a manuscript in press on 29 new species of Elaphropeza (Empididae, subfamily Tachydromiinae). Even amidst this scarcity, Grootaert finds good ground for exploring some very interesting phenomena. “We find the same species or clades in mountainous areas as in the mangroves,” he observes. “We find the same species in Singapore and Padang (the west coast of Sumatra) and the same clade in Yunnan province at the Laotian border!” Grootaert suggests that this current dispersion came about as a result of past periods of glaciation that resulted in dry and arid weather in Southeast Asia (which was then also not yet inundated by the South China Sea). Empidids need humid soil to breed and were thus forced to retreat to higher altitudes and coastal habitats. In Singapore’s sheltered Sime Forest as well as the uplands of Northeast Thailand, Grootaert has found specimens of Platypalpus (above), a genus strongly represented in temperate woodlands but regarded as a glacial relict in the tropics. Returning to dolichopodids, one should not forget the fact that it’s not only their legs that are long. Often, the male’s hypopygium bears long setae (hair) and is mounted on a long stalk that is conspicuously reflexed below the abdomen. Their role in sexual selection and how the flies actually use these long, hairy ducks are little known. Grootaert observes that he might consider naming one new species of Nepalomyia after Priapus, a certain Greek god famed for his member, for its unusually huge ….. In 2002, Grootaert and Neal L. Evenhuls published an annotated checklist of the dolichopodids of Singapore, listing 44 species, including 28 new records, one new genus and five new species. This paper was based on museum material and fieldwork in mangrove swamps. Following Grootaert’s surveys in 2005, at least 190 species are now known to live in Singapore. This leap resulted from Grootaert’s ability to engage in more comprehensive and systematic collection efforts in various habitats. The year-long studies also provided valuable data on the little-known phenology (i.e. the seasonal activity) of the flies. Various collection techniques were employed, including simple hand capture of specimens at rest on tree trunks and solid substrates; sweep netting, pheromone traps (not very successful, noted Grootaert – these yielded only beetles) and coloured pan traps. The latter uses brightly coloured shallow containers that are placed on the ground to attract flying insects that land in the water and drown. The solution contains a little liquid detergent that serves as a surfactant to prevent the insects from using the surface water tension to take-off. Formaldehyde is used by some researchers to preserve the specimens, but here, salt is used instead for safety reasons. Another way of capturing large quantities of insects is fogging, but “we did not do that as there is enough fogging here in Singapore,” stated Grootaert. 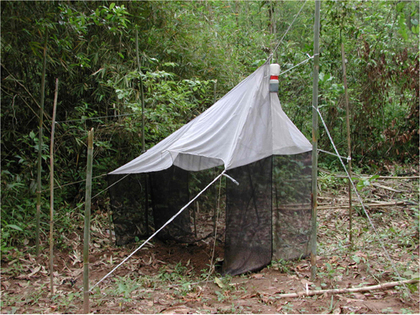 Another effective collection method is malaise traps (above). These traps consist of a semi-transparent vertical wall into which insects crash. The panicked bugs instinctively fly upwards and enter a tent-like compartment from which they can be collected at leisure. Among the sites where pan traps were placed was the HSBC Tree-Top Walk. Here, Grootaert found some Sciapodinae species as well as smoke flies (Platypezidae). These are “very weird things,” he remarked. “If you make a fire with smoke, you will not see anything – but when you take a net and go through the smoke, you will find smoke flies.” These unexpected discoveries point to a need for more studies of biodiversity in forest canopies. A rather surprisingly low species count was obtained from Taban Valley. Grootaert offers the probably reasons of habitat disturbance, regular fogging at nearby residential areas and degraded streams. The valley has changed significantly in the 10 years since he first visited it. “In the beginning there were a lot of huge trees and not much ground vegetation,” he recalled. But now it has become a secondary forest and some streams have dried up. The Nee Soon freshwater swamp patches near Upper Pierce reservoir proved to be apt sites. The high atmospheric humidity and permanently wet peaty soils provided rich pickings. Grootaert placed Malaise traps above or along small streams and found that dolichopodid flies could be found throughout the year in these ideal habitats. In Sime Forest, which is a mix of primary and secondary rainforests, traps were placed at semi-permanent streams. One key discovery from Nee Soon was the first local record of a Syntormon species (S. singaporense), which Grootaert, Ding Yang and Mengqing Wang described in a recent issue of Zootaxa. At the same locale, 25 species of Chaetognoptera could be found on stream-side vegetation, while Neurigona flies were captured from tree trunks. Many Teuchophorus flies were also recorded on the mud flats by the water, and this genus’s Singapore distribution was recently reviewed by Grootaert in a paper that described nine new species, including eight endemic to specific microhabitats on the island. Sungei Buloh and Chek Jawa’s combined count of 91 species is, according to Grootaert, who has plodded through other coasts in the region, the richest known dolichopodid fauna in the world. This begs further questions, as the brackish waters of mangroves are typically unproductive hunting grounds for these flies. “Is it because the mangroves here are quite old?” hence allowing time for speciation,” asks Grootaert. Or the effects of glacially-induced aridity that forced species favouring humid conditions to retreat to these peripheral hold-outs? Siva, the crabbygirl and other mangrove denizens must excuse my poor grasp of mangrove zonation. I gathered from Grootaert that there are areas which are exposed to the full force of the sun and the sea, as well as sections that are protected to various degrees from direct sunlight. Salinity also differs between areas exposed to daily tidal inflows and back mangroves where upswells of freshwater create permanently less saline pools. Each of these microhabitats is home to different species of flies. The mud flats at low tide host swarms of dolichopodids in the genus Thinophilus (above) that run around seeking insect larvae and other prey. About 19 species are found in Singapore’s mangroves, including one named after Dr. D. H. Murphy, a veteran prowler of local coasts. Grootaert has also erected a new genus, Ngirhapium (after Dr. Peter Ng of NUS), to denote certain largish dolichopodids that perch on vegetation at high tide and forage on the water’s edge when the tide recedes. These flies appear to be restricted to this fringe, never venturing further inside the mangroves. Two Ngirhapium flies bear names that commemorate frequent visitors to Singapore mangroves, in N. murphyi and N. sivasothii. Those more sheltered sections where Ngirhapium treads not are home to other genera: Gymnopternus, Paraclius and Phacaspis. The last named comprise just three species of tiny (1 mm) flies known only from littoral habitats in Singapore, Thailand and New Guinea. When one goes further inland, brackish pools that receive seawater only during spring tides offer hang-outs for Teuchophorus flies. On mangrove tree trunks, one can also find resting flies such as the arboreal genus Medetera, which feed on the larvae of bark beetles beneath the bark. Yet another instance of disjointed distribution comes from Neurigona pectinata, a species which Grootaert has found in Thailand and Sumatra above 500 m but also in Sungei Buloh at sea level. Chek Jawa offers other discoveries. Sampling at certain section that is being cleared for the construction of a boardwalk to permit non-destructive observation of the mud flats by the public. Grootaert found a new species – Thinophilus yeoi – and suspects that the newly denuded soil offers opportunities for pioneering species adapted to colonising freshly uncovered resources. Less happily, a site in Thailand where Grootaert found the genus has since been converted to a prawn farm. As for Chek Jawa, Grootaert sites his discovery of 48 species, including six unique to the locality, as reasons why the site deserves permanent protection for its biodiversity wealth. A major problem for students of dolichopodids is the identity and ecology of the larvae. “Where are they? How do they look like?” asks Grootaert. Not a single larva has been found and it would seem that these creatures have special adaptations that allow them to survive in the harsh, marine environment. Little is also known about the phenology of flies. Grootaert’s Singapore sojourn involved a rare attempt to determine the seasonal patterns of dolichopodid activity. A cursory glance at his data shows that in rainforest habitats, there is a peak in May, followed by a smaller crest in September-October. In July-August, few species could be gathered even in permanently humid habitats. Grootaert believes that unlike the case of temperate regions, shifts in the daily photoperiod, humidity and temperature parameters are too insignificant to be determinants of fly phenology. What then accounts for these alternating manifestations of abundance and rarity? Mangroves are also subject to varying levels of activity through the year. At Sungei Buloh, Grootaert found a peak in May which crashed to a low in August before rising again in September. The preliminary data does not distinguish between the different dolichopodid genera and it is likely that flies with specific feeding substrates and zonal preferences will exhibit distinct phenologic patterns. After all the fieldwork, there is much taxonomical work to be completed. One genus, Teuchophorus, has yielded nine entirely new species, excluding three singletons (species known from a single specimen). With a quarter of all Teuchophorus flies known only from singletons, it’s clear that there is huge ground to cover. “These are funny guys,” stated Grootaert, pointing out that the males have very long genitalia with bristles. One species, T. simplicissimus, poses a slight biogeographical puzzle, occuring as it does in Singapore and Tioman island, but not the Malay peninsula. The only visible difference between the two populations is that Singapore flies have slightly smaller genitalia – hardly enough reason to justify a new taxa. 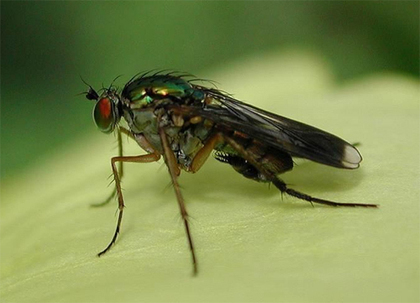 However, sequencing of the genes of fly populations from both islands resulted in discrepancies that warrant caution. While the two populations of T. simplicissimus generated genetic differences ranging from 3.9% to 6.5%, another species, T. stenostigma produced ranges of 8.2% to 9.3%, a degree of difference that veers dangerously towards the unhealthy taxonomic practice of splitting. With the Ngirhapium flies from local mangroves, Grootaert ground up some N. murphyii and discovered sufficient deviations to name a new species, N. sivasothii, in honour of a certain ‘lord of the mangroves.’ Other local personalities immortalised in the annals of zoology include the namesakes of Teuchophorus yeoi and T. luanae. A rather more questionable act emerges from the choice of Grootaertia as the generic moniker of flies bearing, shall we say, ‘unusual’ appendages. For systematists, the phylogeny of dolichopodids poses considerable problems. Once thought to be a relatively young group, dolichopodids and their allies are now believed to have a lineage spanning 200 million years. The family contains 11 subfamilies with two outgroups (Microphoridae and Empididae). Analysis of 87 taxa from various subfamilies has produced a phylogenetic reconstruction that traces dolichopodids to a marine or littoral origin. From this base emerged later tree huggers and moist soil dwellers. After all that work, there still remains painstaking labwork for the description of further new genera such as Promedetera (a primitive group with medetera-like features first discovered on tree trunks in NUS), Prope Premedetera (a group even more primitive than Promedetera), Pheuanphoo (named after another crabbyguy) and taxa that shall remain nameless for now. Biochemical studies and epidemiological work that seek to uncover the secrets of diseases and their possible cures also rely on data that provide precise identification of a species. And in a plea for the conservation of our biodiversity from exploitation that delivers only short-term gains, Grootaert highlights the loss of genetic diversity and resources as a result of habitat destruction and unsustainable development. Designers of new technologies in engineering, material science and medicine are increasingly turning to the earth’s biodiversity for models and molecules that find application in biofibres, coatings, locomotive devices and biofuels, and quite often, nature has perfected solutions that man is only beginning to ponder. Fly on its last legs? As indicators of habitat quality, dolichopodid flies are ideal proxies. Many groups are restricted to small, isolated locales; the Teuchophorus pauper group, for instance, are obligate acid swamp residents. The clearing of a patch of jungle that results in the exposure of a stream bank to direct sunlight can be sufficient to eradicate a population. The paucity of species in a degraded Taban Valley offers an example of the narrow ecological tolerance of these flies. “We saw at Taban Valley very few species, where they should have been hundreds of species,” said Grootaert. All too often, in efforts to restore a habitat, Grootaert laments the purely hydrological approach of engineers who concentrate on physio-chemical indicators such as water quality, soil acidity and nutrient levels. He doesn’t let botanists off the hook either for insisting that the right plants must be present. Often the only entomologist in such committees, Grootaert professes some familiarity with being a lone voice in calling for the return of indigenous insects as the true indicator of a restoration’s success. High diversity is not the best indicator of a good environment, stresses Grootaert. Simply carving out a road or a pool of water in a forest can result in a surge in diversity as new species arrive to colonise the fresh microhabitat, but this is not restoration. One should instead select as indicators those species associated with a certain stage of development of a habitat, in particular creatures that require old-growth forests to thrive. Grootaert’s personal choice is, not surprisingly, insects. Carabid ground beetles, which are apex predators in ground-level invertebrate food chains, are suitable indicators of soil quality. Other helpful species include spiders (not insects but important predators and prey of many insects), ants, hover flies, dance flies and of course, dolichopodid flies. The presence of a good quantity of dead wood (indicating old growth) is signalled by species such as longhorn beetles (which take up to three years to develop as grubs in dead trees), bark beetles, hover flies and jewel beetles. In the tropics, where many forests have been converted into rubber and palm oil plantations, there is the question of whether abandoned estates have the potential to regenerate and reach a state commensurate with their original condition. Assessment methodologies (visual observation, traps etc) need to be further refined and standardised to obtain reliable data. But based on what little is known, Grootaert maintains that restoration will be a timely process. “Ants can take 25 years to return to a forest,” he notes. In other words, physical changes to a natural environment can have a long term impact. And what is the long term, if not a period by the end of which we will all be dead? Freshwater Invertebrates of the Malaysian Region (ed. Catherine M. Yuke and Yong Hoi Sen), Academy of Sciences Malaysia, 2004. My thanks to Siva and Dr. Grootaert for the pictures and presentation slides. Oh my goodness,Marcus, you've done another incredible write up again!! Thanks for capturing Grotaert's talk! This is very interesting. I never thought there are so many species of flies in S'pore! Amazing! This is a Flickr badge showing public photos from budak. Make your own badge here.